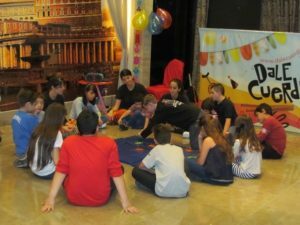 The Argentinian Association for primary immunodeficiencies patients, AAPIDP, was very busy during World Primary Immunodeficiency Week (WPIW)! AAPIDP organised a national patients’ meeting and participated in three other events. 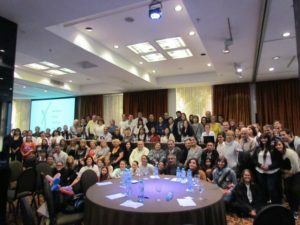 AAPIDP hosted the National Patients meeting on April 22, in the Savoy Hotel in Buenos Aires City. The meeting was well attended with 175 participants, from Buenos Aires City, Buenos Aires, La Plata, Santa Fe and Entre Ríos and focused on the topic ‘Living with a PID’. The event started with the presentation of AAPIDP Board Members on the recent achievements of the Association. Families had the opportunity to share experiences with each other, with healthcare professionals and with AAPIDP’s Board. The main activity of the meeting was the workshop “Living with a PID”. The attendants where distributed in tables of 8 to 10 people and received a list of topics to discuss, both from the patient’s point of view, as well as the relative’s or friend’s perspective. The attendants had 90 minutes to exchange ideas and come up with a list of conclusions and questions that were then presented by one member of each group. Several physicians, nurses and one psychologist took the floor to answer each question and share their own visions on each topic. As a result of this experienced, AAPIDP will start to organize two monthly group phycology therapy workshops intended for patients and relatives, beginning this August. AAPIDP wishes to thank IPOPI, Baxter and CSL Behring for their collaboration towards this event. 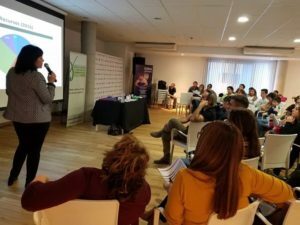 The Argentinian Hemoderivatives Laboratory of the National University of Córdoba (UNC) invited AAPIDP to participate in two events that took place in April 28, in Córdoba: a nursing workshop and a regional patients meeting, in celebration of WPIW. The Nursing Update Workshop began with great news for the PID community. The Executive Director of the Laboratory announced that the National Drugs, Food and Medical Technology Administration (ANMAT) had recently, approved the registry of subcutaneous immunoglobulin. He advised participants to be patient as before commercialisation many steps have yet to be taken. 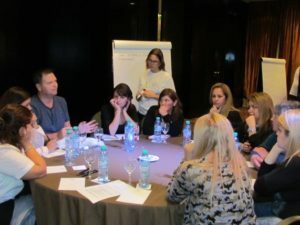 The Workshop focused on nursing techniques and care and provided attendees with comprehensive information on subcutaneous administration of immunoglobulins. In the afternoon, the patients and families were welcomed into the meeting. The participating physicians offered good information on oral hygiene, skin and airways care and AAPIDP’s legal adviser talked about the “Rights of the patient, questions and suggestions on legal management”. AAPIDP is grateful to the UNC Hemoderivatives Laboratory for the invitation, which allowed the patient group to reach out to new families affected by PIDs. Hospital Militar Central in Buenos Aires, celebrated WPIW with a clinical meeting organized by Dr Gabriela Mora and sponsored by the Health Ministry, two medical schools, the Societies for Immunology and Allergy of Buenos Aires and of Argentina. The meeting featured sessions on autoimmunity, autoinflammation, bowel disease and Common Variable Immunodeficiencies (CVID). It provide AAPIDP with the opportunity to further spread awareness of their work and start new partnerships.